Anyone who regularly travels I-81 in Virginia knows the unique dangers this highway presents to passenger car drivers. The terrain is mountainous, roads are winding, tractor trailers seem to own the road, and wintry weather always adds to these challenges. 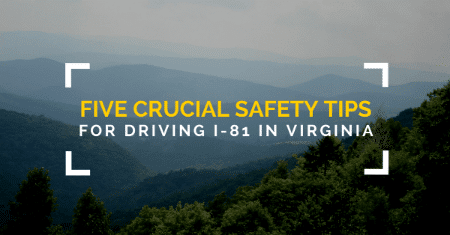 Check out the following tips and information to help you stay safe when navigating Virginia’s longest and perhaps most vital interstate. I-81 was built over 30 years ago, so it frequently undergoes repair work. The top two causes of accidents in work zones on I-81 are driver inattention and exceeding the speed limit, according to a VDOT study. Both are preventable causes of car accidents, so keep this in mind when traveling I-81. Always remain alert for posted changes in speed and traffic patterns within work zones. I-81 is a major thoroughfare for trucks carrying products from the northeastern United States to states in the south and west. As a result, between 19% and 40% of all vehicles that travel I-81 are trucks. However, the interstate was originally designed to accommodate only 15% truck traffic. The high number of tractor trailers traveling I-81 poses a unique danger to passenger cars. Tractor trailers are much heavier than passenger cars. Therefore, they cannot accomplish tasks like braking, turning, or switching lanes as quickly as you can. Here are some facts to keep in mind when you are sharing the road with tractor trailers. The average passenger car weighs around 5,000 lbs. An 18-wheel tractor trailer can weigh up to 40 tons (80,000 lbs). Due to the difference in weight, a tractor trailer needs about 40% more time to stop than the average passenger car. A car traveling at 55 mph needs about 225 feet to come to a complete stop. A semi-truck needs 335 feet. The best things you can do to ensure your safety when traveling near tractor trailers are to remain patient and maintain a large distance between your car and tractor trailers. VDOT reports that 35% of all I-81 accidents are tractor trailer accidents. To avoid becoming part of this statistic, be sure to follow these basic safety tips when traveling near tractor trailers on I-81 in Southwest Virginia. Trucks and tractor-trailers have large blind spots called “no zones.” Be aware that if you cannot see a truck driver in his outside mirrors, than he probably can’t see your vehicle. Use low-beam headlights when following large trucks at night. When being passed by a tractor-trailer, slow down to avoid any water, dirt, or stones that may spray from its tires and reduce your visibility. When switching lanes in front of a tractor trailer, turn your blinker on and leave it on for several seconds before actually switching lanes. This will allow the truck driver time to realize your intentions and begin to slow if necessary. If you are involved in a tractor trailer accident anywhere in the areas of Roanoke, Lynchburg, Danville or other parts of Southwestern Virginia, you may need help getting the compensation you deserve from the trucking or insurance companies. The tractor trailer accident attorneys at Rutter Mills in Roanoke, Virginia have been successfully representing victims of truck accidents for over 50 years. We have the experience, knowledge, and resources to ensure you receive the compensation you deserve – not what the trucking or insurance companies think you deserve. If you’ve been injured, feel free to call us anytime, 24/7. We provide free consultations and we will come to you to discuss your case. Get a Sneak Peek at Our New TV Commercial!